For clothing, basically you want loose pants with a long loose T-shirt over them and a wide belt, for both boys and girls. Sweatpants are good for the pants. Tall boots will help too! 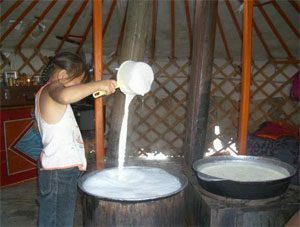 To eat typical Central Asian food without having to cook anything, try plain yogurt with naan or pita bread or rye bread, apple slices and carrot sticks and pickles. Aged cheeses like Swiss cheese, beef jerky, and pickled herring are appropriate too. If you can cook, you might have Russian borscht (beet soup), or kasha with cooked carrots in it, or cabbage soup. Oatmeal cakes are also appropriate. Cite this page: Carr, K.E. 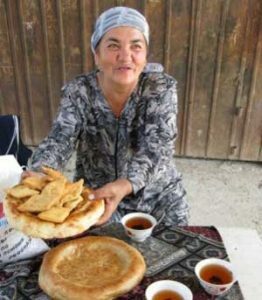 A day in Central Asia – projects, food, costumes, fun. Quatr.us Study Guides, June 8, 2017. Web. April 23, 2019.